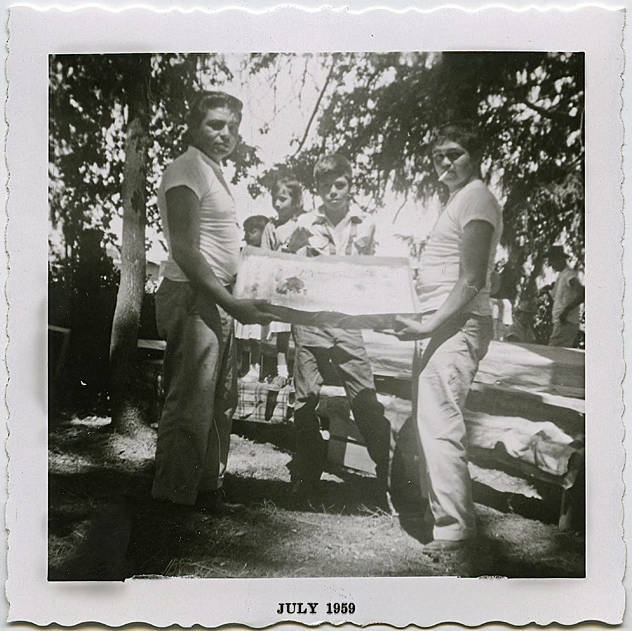 Black and white image of two men holding a decorated sheet cake in a shaded picnic area, while a young boy stands behind watching. Two other children stand on the bench beside a covered picnic table. the men wear jeans and white t-shirts. The image is overexposed and the details of the cake's inscription are not legible, but the picture bears a stamp reading 'July 1959' on the border. Though the event being recorded in this image is unknown, museum records identify the people in the image as members of a group of 'potato pickers,' most likely migrant workers. Migrant farm labor has been an important part of agriculture in Washington County since the early 1900s, though the cultural groups which provide the majority of the laborers have changed over time.